Fine supersoft 100% terry cotton made for temperature control and maximum comfort for your little one. White lightweight supersoft towling measuring approximately 70 x 115cm (non hooded) rectangular baby bath towel. 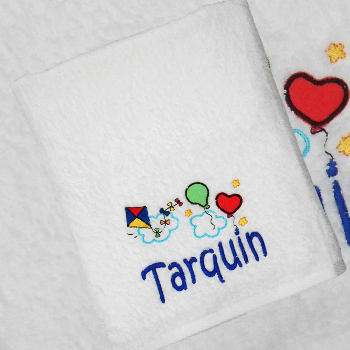 Features applique balloons and kites embroidered motif and also personalised with an embroidered name or initials of your choice.